NES Teachers Corner – Page 6 – Teach STEM? We can help with that! NASA’s Interface Region Imaging Spectrograph, or IRIS, solar observatory separated from its Pegasus rocket and is in the proper orbit. This followed a successful launch by the Orbital Sciences Pegasus XL rocket from Vandenberg Air Force Base, Calif. It was the final Pegasus launch currently manifested by NASA. NASA’s Launch Services Program at the agency’s Kennedy Space Center in Florida managed the countdown and launch. This article is a great extension to the NASA Explorer Schools featured lesson, Geometry: Space Math Problems—Solar Storms. Access this lesson on the NES Virtual Campus. After an extensive year-and-a-half search, NASA has a new group of potential astronauts who will help the agency push the boundaries of exploration and travel to new destinations in the solar system. Eight candidates have been selected to be NASA’s newest astronaut trainees. The 2013 astronaut candidate class comes from the second largest number of applications NASA ever has received — more than 6,100. The group will receive a wide array of technical training at space centers around the globe to prepare for missions to low-Earth orbit, an asteroid and Mars. To check out what these new astronaut candidates will have to prepare for in space, check out NASA Now: The Body In Space. This video can be found on the NASA Explorer Schools Virtual Campus. The sun emitted a mid-level solar flare, peaking at 6:49 p.m. on June 7, 2013. Solar flares are powerful bursts of radiation. Harmful radiation from a flare cannot pass through Earth’s atmosphere to physically affect humans on the ground, however, when intense enough, they can disturb the atmosphere in the layer where communications signals travel. This disrupts radio signals for as long as the flare is ongoing, anywhere from minutes to hours. This flare is classified as an M5.9 flare. M-class flares are the weakest flares that can still cause some space weather effects near Earth. This flare caused a moderate radio blackout, rated an R2 on the National Oceanic and Atmospheric Administration’s space weather scales, which range from R1 to R5. It has since subsided. This is a real-world connection to the NASA Explorer Schools featured lesson, Geometry: Space Math Problems—Solar Storms. To access this lesson, visit the NES Virtual Campus. To read more about this solar flare and see an image of the flare captured by NASA’s Solar Dynamics Observatory, visit https://www.nasa.gov/mission_pages/sunearth/news/News060813-m5.9flare.html. Students and educators are invited to join NASA for the Sally Ride EarthKAM Summer 2013 Mission from July 9-12, 2013. Guide your students in hands-on research as they program a camera aboard the International Space Station to take pictures of specific locations on Earth. The optional online curriculum at the Sally Ride EarthKAM website is designed for middle school students, but could easily be adapted for other grade levels. All students and educators are invited to participate, including participants in summer and after-school programs. For more information and to register for the upcoming mission, visit the Sally Ride EarthKAM home page at https://earthkam.ucsd.edu/. NASA’s Gravity Recovery and Interior Laboratory, or GRAIL, mission has uncovered the origin of massive invisible regions that make the moon’s gravity uneven, a phenomenon that affects the operations of lunar-orbiting spacecraft. This mission update is a great classroom extension to the NASA Explorer Schools featured lesson, Engineering Design Process: On The Moon. To have your students playing the role of engineers in designing lunar missions, access this set of engineering design challenges on the NES Virtual Campus. To read more about GRAIL’s discovery, visit https://www.nasa.gov/mission_pages/grail/news/grail20130530.html. Detailed analysis and review have borne out researchers’ initial interpretation of pebble-containing slabs that NASA’s Mars rover Curiosity investigated last year: They are part of an ancient stream bed. 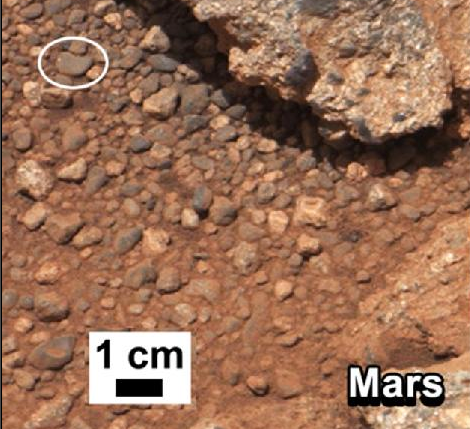 The rocks are the first ever found on Mars that contain stream bed gravel. The sizes and shapes of the gravel embedded in these conglomerate rocks — from the size of sand particles to the size of golf balls — enabled researchers to calculate the depth and speed of the water that once flowed at this location. To learn more about the challenges the Mars Science Laboratory team faced during Curiosity’s landing, also known as the “seven minutes of terror”, check out NASA Now: Forces and Motion: Curiosity—Entry, Descent and Landing. You can access this classroom video on the NASA Explorer Schools Virtual Campus. NASA Explorer Schools and the National Science Teachers Association are hosting a 90-minute live professional development Web seminar for grades 6-8 educators on June 4, 2013, at 6:30 p.m. EDT. This seminar will address the Next Generation Science Standards. As a result of this seminar, you will be able to use the lesson “Engineering a Stable Rocket” from NASA’s Rockets Educator Guide to address the middle school dimensions associated with forces and interaction performance expectations. This seminar provides an overview of the activity, explores the NASA connections, shares tips and tricks for implementing this lesson in the classroom, showcases videos of students engaged in the lesson and discusses possible modifications or extensions. This is the only time this seminar will be offered during the current school year. NASA is tracking a large near-Earth asteroid as it passes by the Earth-Moon system on May 31st. Amateur astronomers in the northern hemisphere may be able to see the space rock for themselves during the 1st week of June. The closest approach of the asteroid occurs on May 31 at 4:59 p.m. EDT, when the asteroid will get no closer than about 5.8 million kilometers, or about 15 times the distance between Earth and the moon. Approaching asteroid 1998 QE2 has a moon. Researchers found it in a sequence of radar images obtained by the 70-meter Deep Space Network antenna at Goldstone, Calif., on the evening of May 29th (May 30th Universal Time) when the asteroid was about 6 million kilometers from Earth. To read more and see a video about asteroid 1998 QE2 go to Science@NASA. NASA’s first mission to sample an asteroid is moving ahead into development and testing in preparation for its launch in 2016. The Origins-Spectral Interpretation Resource Identification Security Regolith Explorer, or OSIRIS-REx, passed a confirmation review Wednesday called Key Decision Point. 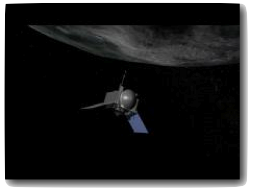 NASA officials reviewed a series of detailed project assessments and authorized the spacecraft’s continuation into the development phase.OSIRIS-REx will rendezvous with the asteroid Bennu in 2018 and return a sample of it to Earth in 2023. This is a great extension to NASA Now: Primitive Asteroids: OSIRIS-REx. NASA Now is an Emmy Award winning educational series provided by NASA Explorer Schools. To access this program, visit the NASA Explorer Schools Virtual Campus. To read more and watch a video overview of the OSIRIS-REx mission, visit https://www.nasa.gov/mission_pages/osiris-rex/osiris-rex-development.html. Solar activity continued on May 14, as the sun emitted a fourth X-class flare from its upper left limb, peaking at 9:48 p.m. EDT. This flare is classified as an X1.2 flare and is the 18th X-class flare of the current solar cycle. The flare caused a radio blackout – categorized as an R3, or strong, on NOAA’s space weather scales from R1 to R5 — which has since subsided. The flare was also associated with a non-Earth-directed Coronal Mass Ejection. CMEs and flares are separate but related solar phenomena: solar flares are powerful bursts that send light and radiation into space; CMEs erupt with billions of tons of solar material. They often, but do not always, occur together. Any time we can see a solar flare from Earth’s view, than at least some of its light and radiation must be directed at Earth. CMEs on the other hand may or may not be Earth directed. NASA observes CMEs even when they are not traveling toward Earth, because they may impact spacecraft. To read more and see some incredible imagery on this solar activity, visit https://www.nasa.gov/mission_pages/sunearth/news/News051513-ar1748.html. This story is a great real-world connection to the NASA Explorer Schools featured lesson, Geometry: Space Math Problems—Solar Storms. To access this lesson, visit the NASA Explorer Schools Virtual Campus.